You (or someone you know) may be experiencing moderate or severe fatigue with a lack of energy, decreased exercise endurance, or the kind of exhaustion that results from the flu or lack of sleep. Sometimes the fatigue is more of a problem than the pain. 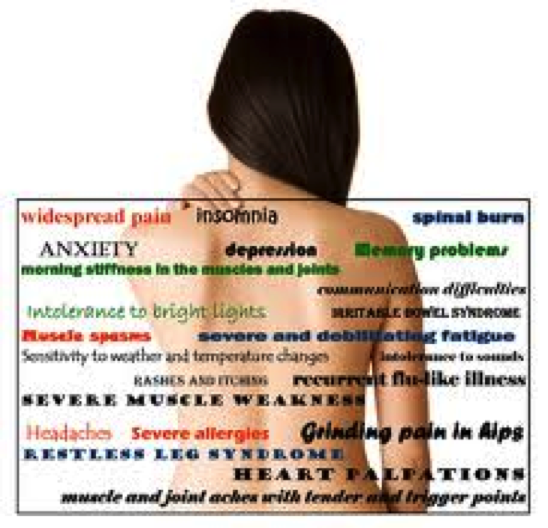 Headaches, especially tension and migraine headaches are common in Fibromyalgia. Abdominal pain, bloating, alternating constipation, bladder spasms, and irritability may cause urinary urgency or frequency. Your skin and blood circulation can be sensitive to temperature changes, resulting in temporary changes in skin color. Throughout our years in practice, we have tried the full range of therapies and treatments available to us, with minimal improvement. I knew there had to be more, a method of treatment that could help them (and you!). I began searching to find the answer….and then….I found it. The answer to helping most Fibromyalgia symptoms- Oxygen Enhanced Brain Based Therapy. We found out about this breakthrough therapy from my friend and mentor and best selling author, Dr. Michael Johnson. After talking with Dr. Johnson and studying his breakthrough techniques we have finally been able to help people with Fibromyalgia and many other chronic symptoms. Yes, for most people the answer is really that simple: Oxygen Enhanced Brain Based Therapy. You are most likely starting to wonder “What is care going to be like?” We can tell you from personal experience and from watching patients and staff participate, that they are beneficial and enjoyable. Care can include one-sided adjustments, simple exercise, eye exercises, heat and other activities, all while on oxygen. These techniques coupled with a full neurological and nutritional workup have enabled us to help most of our patients to get rid of their chronic symptoms no matter how long they have been experiencing them. If you would like to have more information on Oxygen Enhanced Brain Based Therapy or to set up a consultation and see how it can help you (or someone you know), give us a call at 630-257-0555 to set up a consultation with the doctor.